Our national parks are places where we strive to share the American experience, tell the stories of those who have gone before us, share the lessons we’ve learned, share the stories of protecting our civil liberties, stories of peace and reconciliation. 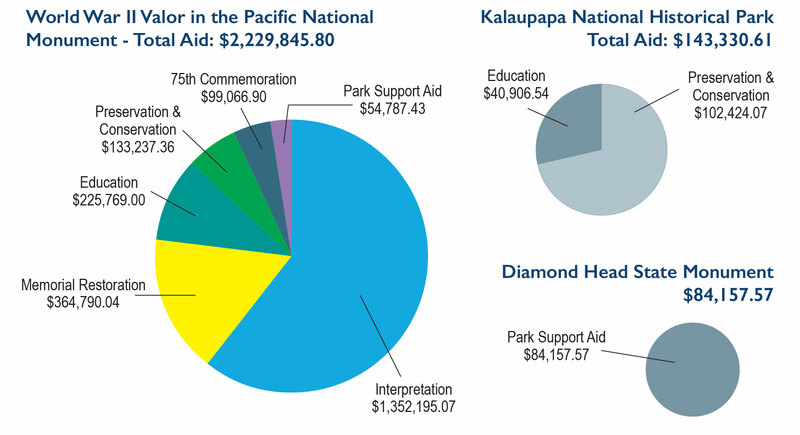 At each of our parks, national and state, through your generous donations, Pacific Historic Parks is able to support educational, interpretive and scientific programs, through school group visits, outreach programs, Junior Ranger and Reef Ranger programs, and the many ongoing restoration projects. In partnership with the University of Hawaii – West Oahu’s archaeological field school, Honouliuli National Monument was chosen as the site for 16 students working on their bachelor’s degree with a concentration in archaeology or certification in Applied Forensic Anthropology. Honouliuli is the former site of Hawaii’s largest and longest-operating internment and prisoner-of-war camp during World War II. As plans for the 75th Commemoration of the Dec. 7, 1941, attack on Pearl Harbor and Oahu continued, careful considerations and preparations were made for the many returning Pearl Harbor Survivors and World War II veterans and their families. More than 10,000 people flew in from all over the world to participate and bear witness to this special and solemn occasion. “Honoring the Past, Inspiring the Future,” the theme for the 75th Commemoration, is ever present at World War II Valor in the Pacific National Monument, where today’s younger generation and the Greatest Generation come together every day. With the vision to enhance the visitor experience at Pearl Harbor as well as bring the Memorial to those unable to visit, PHP in partnership with the NPS at Pearl Harbor created a 3-D virtual reality experience. There are three virtual reality tours: Walk the Deck of the USS Arizona Before the Attack, Witness the Attack on Battleship Row and Experience the USS Arizona Memorial. The Sadako Peace Crane Project has grown exponentially. Working with local students and students from Japan, tens of thousands of our visitors are learning about Sadako’s wish for world peace. More than 10,000 origami paper cranes were folded by students in Hiroshima and Tokyo, each inscribed with a message of peace, and have been sent to Pearl Harbor to share with our visitors and spread the message of peace throughout the world. One teacher from Tokyo writes, “Today, students in Japan are learning about what happened in World War II in their social studies class but didn’t know what people in the U.S. have thought about it. We are very happy this project will promote reconciliation of two countries, and spread peace around the world.” On the folded cranes are written messages. One says, “Past is the past. Let’s think about our future! Pray for peace.” Once a month, students and teachers from Punahou School and Island Pacific Academy volunteer at the Pearl Harbor Visitor Center, teaching visitors how to fold the paper cranes and sharing with them the significance of folding a crane. Here at World War II Valor in the Pacific National Monument, we can’t help but see the magic happening all around us. It’s magic to see the enthralled expression on a Make-A-Wish child’s face when they meet one of our superheroes, a Pearl Harbor Survivor who graciously volunteers his time to share his experiences with visitors and our youth. It’s magic to watch their faces when the light bulb goes on when they comprehend the tragedies of war and the perseverance of a nation pulling itself back together again and make the connection to their own lives. It’s magic to be a witness to the strength, hope and joy in each of these children — they inspire each of us to continue to share through the power of a Wish. In fiscal year 2015-2016, we were given the privilege of fulfilling the wishes of 188 children and their families. Kalaupapa National Historical Park is situated on a peninsula on the northern coast of Molokai. There is a long-standing restriction against entry for anyone under the age of 16. In order to fulfill the nationwide Every Kid in a Park initiative, park rangers had to bring the park to the children. Kalaupapa NPS staff packed up their gear, ranger uniforms, archaeological tools, plant and animal samples, and over three days they engaged more than 240 students in hands-on activities, demonstrations, a hike and a field trip to help bring the Kalaupapa story alive. The boundaries of War in the Pacific National Historical Park and American Memorial Park extend into the waters surrounding them. The education programs at both parks use the parks as classrooms. The Guam Teacher Workshop engages educators to use their national park as a resource for studying events, the impact of political and social trends, and the effects of the climate and how people impact the environment. Educational programs like Reef Ranger Summer Camp, Art in the Park, Junior Ranger and Service to the Land and Sea programs expose the children of Guam and Saipan to the values of their natural resources. Together with the staff of Diamond Head State Monument, an audio tour was developed with Acoustiguide, to provide an informative and enhanced experience for the hiker. In addition to the breathtaking views from the crater’s summit, visitors learn all about the formation of the crater, geological and botanical attributes, and its historical and cultural place in Hawaii’s history. Musicians and cultural, historical and scientific experts volunteered their talents and time to the research, development and production of this audio tour.